Sometimes life can seem so temporary...like living in a tent. I have to admit that I am a city boy and my idea of camping includes electricity, safety and a laptop or television! 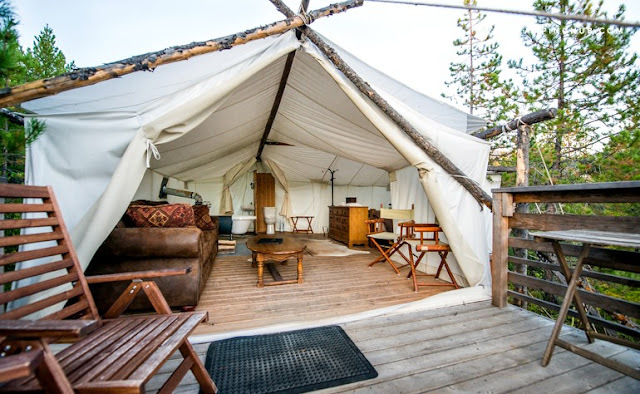 I think these days they call this glamping:) I can go camping and stay in a tent for a short period of time but I always look forward to my home and my furnishings. I think that maybe the Lord had those feelings in mind when he talked to us about not worrying so much about the stuff we have or the places we live. Life is like a tent. It's up and it's down. It's not always stable and sometimes its easy to cave it in. But we have an eternal place in heaven that has been prepared for us. You don't have to worry about human error in the construction of it for it was made by God! You may feel at times like your body is wasting away, your strength is diminishing and your eyesight is fading. Just remember that inwardly you are being renewed and God is preparing you for a mansion in glory. When it's time to pack up the tent, you can smile cause it's time to go home again!